Hi There! I’m Jennifer Rizzo from Jennifer Rizzo Design Company. I am so excited to be a part of the collaboration with Cricut and Hayneedle and to share with you how I contributed to transforming the space into a dreamy and fun bedroom! 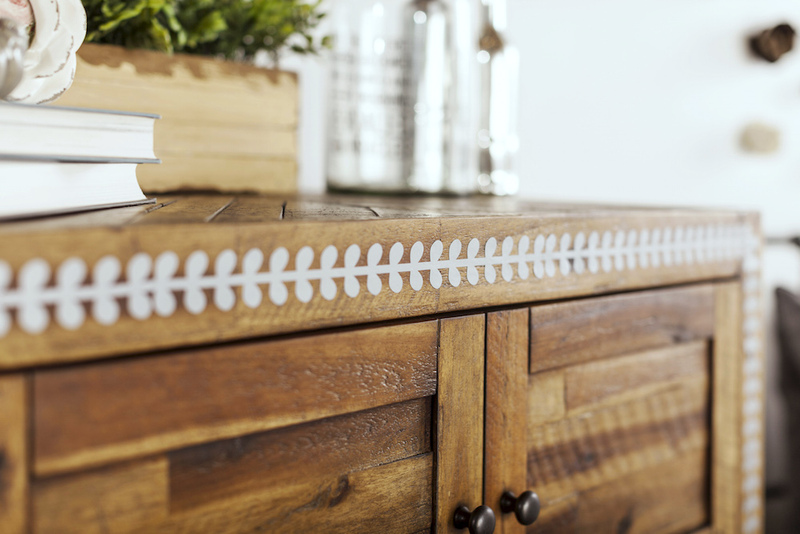 Today, I’m going to tell you a little bit about how I embellished the Hayneedle wood dresser. 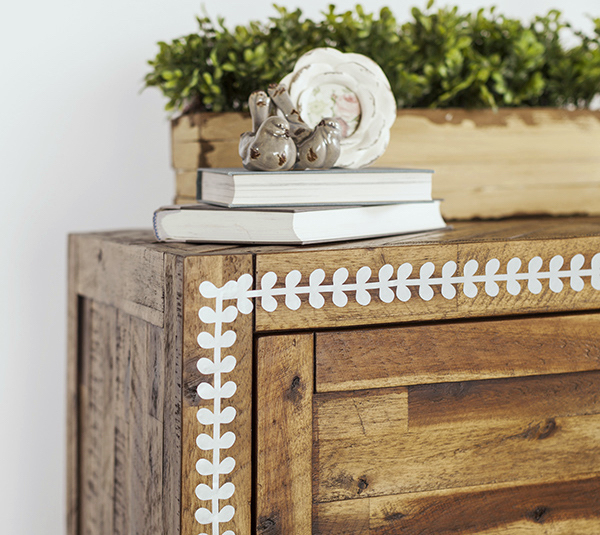 I worked on coming up with a design that would work with the rustic industrial style, and would also enhance the awesome dresser from Hayneedle. I knew I wanted to do something that had a faux inlay feel, which I always think feels expensive. It reminds me of custom handmade, artisan furniture. 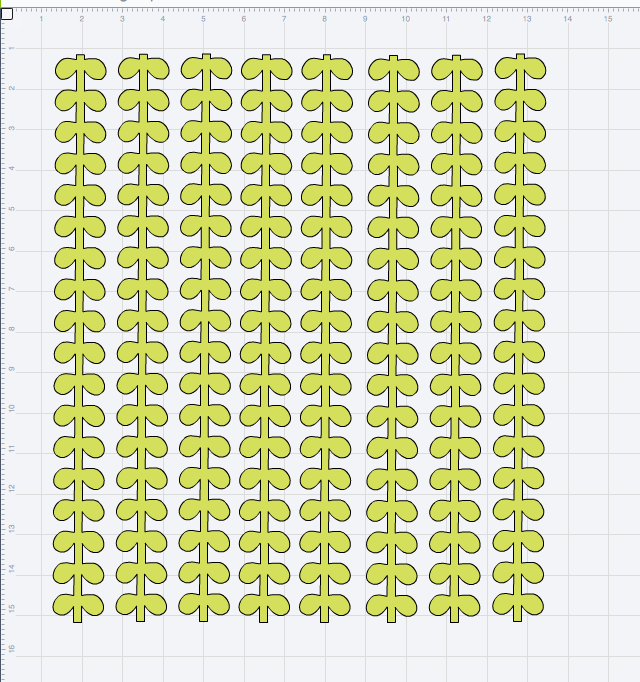 When I found the vine pattern in Cricut Design Space (literally you can click in the image bank to find thousands of pre-made images), I knew it would work out perfectly. I used the silver vinyl, a 12” x 24” cutting mat, scissors, and the weeder tool. That’s literally all you need! I decided on using the silver vinyl because I thought that would work the best for the look we were going for, though I think gold foil, bronze or even copper foil would be beautiful as well. Cricut has an amazing array of metallic adhesive foils that are absolutely gorgeous. This is such an easy project to add such a beautiful detail. I started by measuring the edge of the dresser, and decided to make the inlay about an inch wide. After I had the size I wanted, I cut the pattern to my size on the Cricut Explore Air 2 using a 12” x 24” mat. I then used the weeder tool to remove the excess vinyl from around the edges. I did find it works better to pull the excess vinyl away carefully. I went a little too fast and ended up slightly ripping a few vines. I measured and drew a line in the direct center, around the dresser, to make sure I placed my vine as straight as possible. At the edges, I trimmed and matched them up. I decided to keep my vines and leaves going in the same direction as I moved around the dresser. The finished project ended up looking amazing! I think it really adds a nice, creative touch and highlights the beautiful wood. And the best thing about using vinyl on furniture is if you decide you want to change your room design, no problem, just peel it off! It was such an amazing experience, and the room is just beautiful and dreamy! Now is your chance to make your own space. Make sure you enter here for more home decor inspiration, and a chance to win a Cricut Explore Air 2 bundle, a $2,000 shopping spree on hayneedle.com, plus a consult with a room stylist (me!) to pull it all together!! Leave a comment and let us know what you think and if you LOVE this project, make sure to share it with a friend!